eg. "This is a donation in honor of my friend. Good luck!" 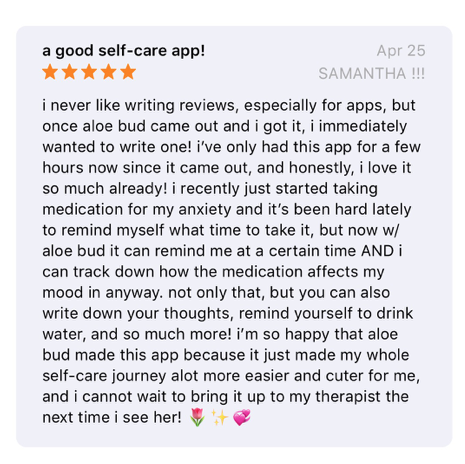 Welcome to our fundraiser to bring "Aloe Bud: self-care companion" to Android devices and beyond! Aloe Bud is a cute little self-care pocket companion. It was designed by someone who struggles with mental illness, routine and remembering self-care. Which is why Aloe Bud uses Push Notifications to gently remind you to hydrate, take screen breaks, move around, and more! All according to your schedule and lifestyle! No unwanted notifications. Since launching to the App Store, we've been featured as App of the Day and over 300,000 people have created a self-care dashboard of their own. If all our followers across social media donated even $1, we could start development by January. Thanks for your help and support, we really couldn't do it without you!